Transverse isotropy is characterized by a plane of isotropy and an axis of anisotropy. For rocks, the plane of isotropy is associated with the bedding plane, whereas the axis of anisotropy is the normal to the bedding plane. Transversely isotropic rocks are known to exhibit strength that depend on the orientation of the bedding plane relative to the direction of load. 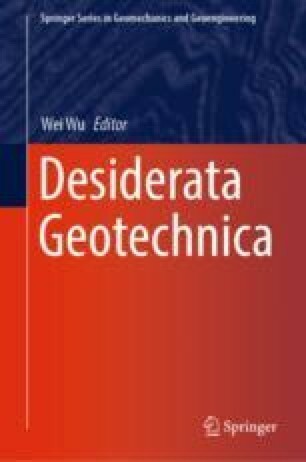 In this work, we present a constitutive framework for predicting the deformation and strength of transversely isotropic rocks. The model is based on anisotropic critical state plasticity with thermal softening. We conduct numerical simulations of boundary value problems to demonstrate the impact of bedding plane orientation on the deformation and strength of a transversely isotropic rock. This material is based upon work supported by the U.S. Department of Energy, Office of Science, Office of Basic Energy Sciences, Geosciences Research Program, under Award Number DE-FG02-03ER15454. Support for materials and additional student hours were provided by the National Science Foundation under Award Number CMMI-1462231.